- instead of the traditional catalogue, write a book, to accompany the dual exhibition. 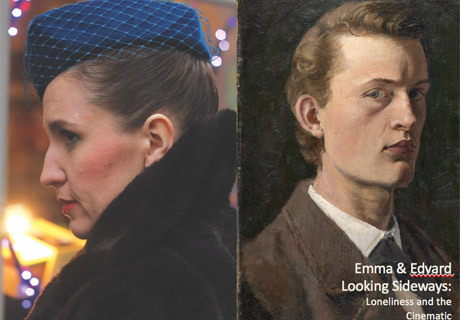 The exhibition will be titled Emma&Edvard: Love in the Time of Loneliness. This is just to get an impression of the use of powerpoint to design curatorial projects. Ome paintings I had provisionally selected turned out to be already promised for loan; Munch is so hot these days! But there was enough, among the 1.100 painting. In total, I have chosen some 75 works, distributed over the seven large galleries: the entire museum. For each gallery we made a slide. Simple as it is, power point is an effective tool to present a sketch of an exhibition project. At the museum they were impressed that I was able to present a concept so quickly. Once it was complete and approved, the museum had a three-dimensional design made, needed to see proportions, scale, and position. This next step is much more precise, and it is quite likely that even at the last moment I will have to change order and placement of pieces in the different rooms. But each room already has a theme, or motif, that will give it a special atmosphere, different from room to room. Here is my favorite painting of loneliness; a merciless self-portrait. The sagging shoulders and interiorized gaze speak volumes to the expression of loneliness; the painting almost becomes an emblem of that psych-social state. Colour plays a part in that strong impression. The man’s suit in tones of green, blue and a touch of brown is not only different in colour but also in that the composition of the colour field out of patches of pigment, offset by the red tie, gives a different texture from the other colored fields in the painting. The bottle on the table looks full; the man is not drunk, as the cliché interpretation would have it. In terms of composition, I’d say that he is lonely structurally: because the two men in the background are together, even if they turn their back to each other; he is alone by contrast. And so is the strange figure in the background on the right. This repetition of the motive of loneliness makes it a social affliction; not just the sorry state of a disturbed individual, as is so frequently assumed. But if you look at the orange stain behind the back of the chair on which he is sitting, you will see that the primary excitement of this painting comes from the dynamic relationship - tension more than harmony - between figuration and abstraction. A word about my choice of these two images in the left column together as provisional emblem of the show. 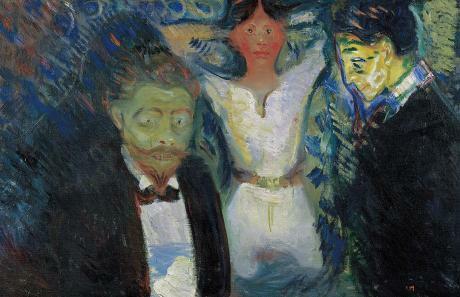 The signature painting of Munch, here on the right of the dual image, is a very early self-portrait. Although self-portraiture requires looking into the mirror, it is clear that the model-artist here has tried to avoid that direct look at the viewer that this would so easily entail. It is this painting that has inspired my choice of “looking sideways” as an entrance into the meeting point of cinematic technique and loneliness as the result of avoiding direct looking. The young man seems to avoid and yet to crave eye contact. Emma, in the left-hand image, is also not quite looking straightforwardly. Her gaze is between looking ahead and hesitating if she will look at whatever or whoever is next to her. In the scene, she is being lured by luxury commodities, a lure that will lead to her undoing. But she also seems shy - as shy as Edvard, in his own way, seems to be. Below she is in the grip of her stalking, blackmailing neighbor, Homais. This exhibition explores Munch’s modernity bringing his work in dialogue with Flaubert’s novel Madame Bovary through contemporary video work Madame B by Mieke Bal & Michelle Williams Gamaker that interprets his novel for today. 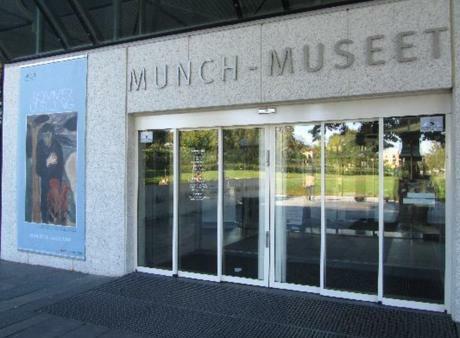 The exhibition integrates 8 video installations (19 screens) with about 70 of Munch’s works, and is divided in 7 spaces, each devoted to a relevant aspect of the overall theme. It examines the consequences of an indirect, “shy” look at the social world, leading to loneliness. Through a confrontation between Munch and Flaubert, visitors will be enticed to reflect on the social nature of looking, and what happens when we deny visual dialogue. 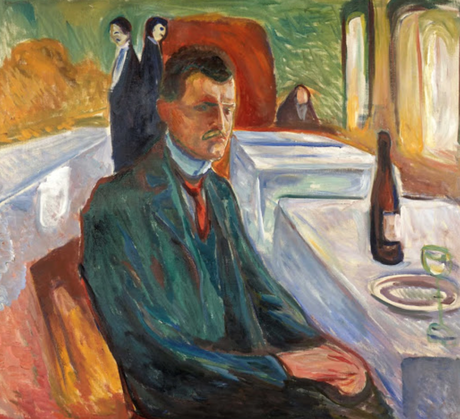 Munch’s work is strongly cinematic, an aspect that is mentioned in the literature but not examined in depth. The exhibition will explore, for example, the suggestion of movement, both bodily and emotional; of seriality, animation, transformation. Also, the paint itself, with its sometimes-hasty brush strokes, the primed canvas remaining visible, and at other times, thick strokes that leave the movement of the brush visible in the pigment, seems unstable. And since visitors are themselves in charge of making up the narratives that fits their own interests, the paintings are closer to, specifically, video installation than theatre film. The loneliness due to a socially clumsy mode of looking, and the way cinema is capable of rendering such emotional nuances and allow the public to understand and affectively engage with it, also characterise the mid-nineteenth-century pre-cinematic, but prophetic novel Madame Bovary by Gustave Flaubert, from 1856. Michelle Williams Gamaker and I have made a video work that brings this novel to contemporary society. In the video installations the consequences of looking sideways and the resulting loneliness are staged for immersive viewing. Here, too, the incapability of direct and dialogic looking is combined with a harsh social reality. There, an incipient capitalism and a persistent romantic conception of love, in a perverse interweaving of the new and the old, conspire to victimise those who are not completely skilled in social behavior within such a society. It produces a devastating loneliness. The integration of paintings (and some graphic works) in a curatorial mode that foregrounds both aspects of Munch’s works - the social loneliness and the cinematic mode of expression - with the installations that foreground the same features in Flaubert’s writing is meant to enhance both aspects in the (audio-)visual dialogue that results. Unexpected connections, not immediately obvious but more powerful once they are perceived will emerge and heighten the effects of both bodies of works once they are presented together - different and yet, cohesive. The exhibition project has now officially been approved, and I have made several trips to Oslo already, working together with the in-house curator Ute Falck, and other staff members who are all wonderfully committed, bristling with friendliness and expertise. I have selected all the works now, and examined them in vivo, in the storage space. This was extremely exciting and far from superfluous; it lead to a few revisions, and a lot of changed and nuanced notes. Most of the paintings of Munch are not cheerful. Nor are they smoothly painted, in the naturalistic style of his day. What intrigues me in the work below, Jealousy from 1907, is the combination of gloomy atmosphere with the vision of vision depicted. The three people don’t look at one another. The supposedly lucky second guy looks as unhappy as the man who is literally green with jealousy, and looks mad as a result of his affliction. And while the two men stare with an inward gaze, the woman, in spite of her worldly, voluptuous pose, stares just as uncheerfully, straight at the viewer whom, clearly, she doesn’t see. She is no more “there” in the social moment as the two men. This is one work from what we now see as a series of paintings on the topic of jealousy. Munch often produced several works on a topic, which deceptively make them seem to be a series. This is not so clear. Frequently, the wish to return to a topic was motivated by the desire to improve or to vary on the earlier work. This pseudo-seriality adds to the cinematic impression the oeuvre makes. The inward or vague gazes of the figures are quite representative of what Munch does with his figures’ eyes. They never, or barely ever look at the viewer with something we can recognize as an alive act of looking. Once I noticed this, I was astonished by how systematic that evasiveness is - variations upon the sideways look.